Washington, D.C. — The Form-Based Codes Institute (FBCI) at Smart Growth America announced the winners of the tenth annual award for achievement in the writing and implementation of form-based zoning codes: the Akanda SmartCode for the Akanda Commune in Gabon, Africa; and the Beaufort Code, for the City of Beaufort, S.C. Sometimes invisible to the average person, zoning plays an important role in shaping the way communities grow and change over time. Form-based codes can be a powerful way for cities to reform their zoning, incorporating smart growth principles to foster mixed-use, walkable communities that preserve their unique look and feel. The Driehaus Form-based Code Award recognizes exceptional codes that are easy to understand and administer, match the community’s vision, and guide the market to produce predictable, human-scale development. Nominated codes are also assessed for their potential as models for other communities and the inclusion of novel and exemplary features. The Richard H. Driehaus Form-Based Code Award is sponsored by FBCI with the generous support of the Richard H. Driehaus Charitable Lead Trust. Nominated codes are critiqued by a jury of peers. Mary Madden, Chair of FBCI’s 2018 Driehaus Award Jury, announced the winners at an award ceremony during the Congress for the New Urbanism’s 26th Annual Congress in Savannah, Ga., in May. The two winning codes reflect the very different contexts in which they were adopted. Akanda SmartCode — Akanda is a fast-growing area just north of Gabon’s capital city, Libreville. The Akanda SmartCode is a superb example of a code that is easy to use. The code is highly graphic and incorporates straightforward checklists for different development types. The SmartCode is a great model for developing countries and demonstrates how a code can be adjusted to suit a community’s unique circumstances — in Akanda’s case, a tropical climate in “a country that had no history of development regulations and little history of land ownership,” according to Opticos Design (https://opticosdesign.com). Read more from Opticos Design about the Akanda SmartCode in Gabon, Africa at https://opticosdesign.com/blog/akanda-smartcode-coding-for-sustainability-in-developing-countries and https://opticosdesign.com/wp-content/uploads/2017/08/Akanda-SmartCode-Overview-Opticos.pdf. Beaufort Code — The Beaufort Code for the City of Beaufort, S.C., came out of an effort to manage growth in a vulnerable coastal environment while maintaining the community’s uniqueness. 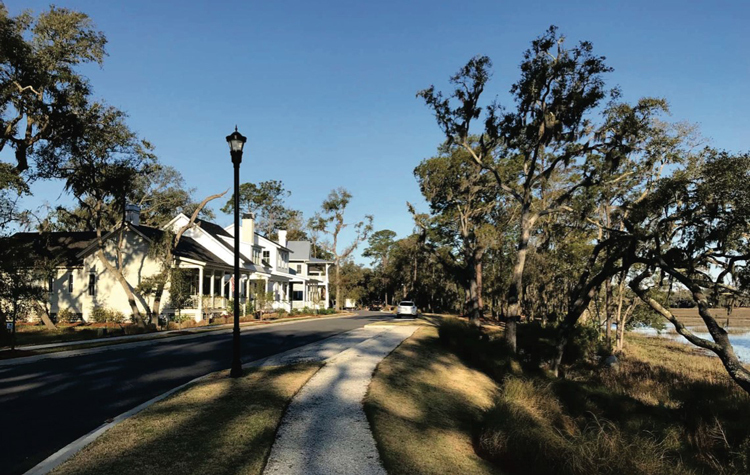 The new code works with other recently completed form-based codes for Beaufort County (the 2015 Driehaus Award winner) and the neighboring Town of Port Royal “to implement a shared, regional vision across jurisdictions,” according to Opticos Design. View the Beaufort Code in its entirety at http://www.cityofbeaufort.org/Data/Sites/1/media/Departments/planning/beaufort-code-adopted-june-27-2017-amended-september-26-2017_sm.pdf and read more about the development of the code from Opticos Design at https://opticosdesign.com/work/multijurisdictional-place-types.